Thank you for using a PENTAX K110D digital camera. 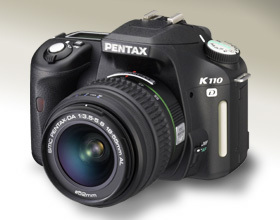 PENTAX wishes to announce the release of Firmware Update Software Version 1.02 for K110D. Only K110D users are permitted to download the firmware update. the firmware update file to the SD card by connecting the camera directly to your computer. fwdc165b.bin: This is the updated firmware. After formatting the SD card, copy the fwdc165b.bin file to the route directory of the SD card.